Reduce your enemies to mere pixels. Cheers, I will take a look! If you enjoy this sort of things, you can take a look at my never-ending project of a game ( http://kimmosblog.com/smallshooter/ ), the development of which is currently slightly on hold, since I had to get a day-job to continue subsisting... You can probably see the lineage, although I have to confess that this #lowrezjam effort is a lot smarter effort in many (mostly techincal) ways. Thanks, it seems I'm making the same game over and over again, each time more simple than the last. Maybe I should start from here and develop this one further! Cool effects, and title was accurate. Thanks for all for having a go, despite some technical hiccups. 8-) Having a day job really interferes with your game development activities! 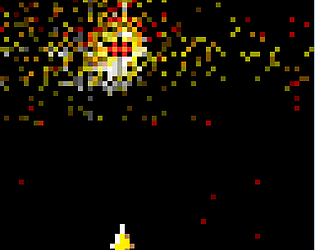 Didn't work on the game page, but could play on the alternate address - nice particle fx and enemy trajectories!